Vapour barrier. Vapour barrier paint. Polyethylen vapour barrier. Vapour barrier. Vapour barrier paint. Polyethylene vapour barrier. 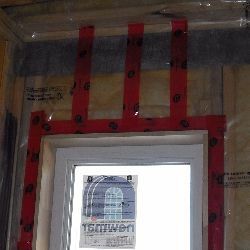 The vapour barrier is one of the most important components of the house. Without a properly installed vapour barrier, condensation will form within the exterior wall structure and, over time, lead to structural damage (wood rot) and unhealthy (mold) living conditions. It is an absolute must that the vapour barrier is installed on the warm side of the insulation. It has to be strong and be able to stand up to abuse during construction. Seams should be sealed with a special tape, see red tape in photo. 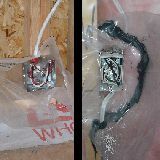 Electrical boxes and other outlet boxes should be covered with a piece of vapour barrier before installation. Later, when the barrier is installed on the entire wall, the loose ends will be sealed to form a continues vapour barrier, see photos. There are also airtight outlet boxes that come with a rubber seal (the black gasket in the photo). They are more expensive than the standard outlet box but are great time savers as they eliminate the need of wrapping each box in a piece of vapour barrier. A bead of acoustical sealant should be applied along the top and sill plates to provide a good seal. 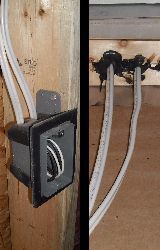 Caulking is also required around electrical wires that are routed through the top plate and attic, see photo. Perm rating. The effectiveness of vapour barrier material is measured in terms of its "perm" rating. The lower the perm rating, the more effective the vapour barrier. For new construction and renovations the material most used is 6 mill (0.15 mm) polyethylene. It is sold in rolls 8' 6" (2.59 m) and 10' (3.05 m) wide. Rolls of polyethylene should not be stored in direct sunlight over a long period of time. Recycled or virgin material. Spend the extra dollar and use barrier made from virgin polyethylene, available from stores serving contractors. Most vapour barriers sold in home improvement outlets are made from recycled polyethylene. Vapour barrier or oil based paints can also serve as an effective vapour barrier in older homes where it is not always possible to install a polyethylene vapour barrier. An article published by Natural Resources Canada states: "In most older houses, the layers of oil-based primer paint and varnish finishes can function as an adequate vapour barrier for walls and ceilings. Areas that most often require special applications of vapour barriers include interlocking ceiling tiles and new drywall. Pay special attention to areas of high humidity, such as kitchens and bathrooms"
For more information on vapour barriers, vapour barrier paint or oil based paint applications go to vapour barrier paint.